Applications registering with the system tray provide one of those categories. An instant messaging application or an email client will fall into 'Communications'. System services are for example software update notifications. Examples for Hardware are a battery monitor a mixer or a Network Management applet. Applications that use the system tray for freeing space in the taskbar use the Application Status category. The system tray implementation can choose to provide the information delivered by the client application in different ways. A System Tray Item will Have the following elements and properties. The visualization of the registered application is determined by the system tray. It can be implemented as row or grid of icons, as in current system trays. The longer term perspective is to offer category-specific visualization for the applications. Applications that want to expose more control through desktop elements such as the system tray can choose to offer applets to support their specific requirements. The interactions can be considered in terms of the 'Client' i.e. the icon itself, and the 'Host' e.g. the system tray. Providing an interface for actions allows for coherent interaction across applications using the system tray. A client of the system tray is an application that registers with the system tray to display its information. The system tray (the host) reacts to signals it receives from the client. The host also can pass back an action to the client application, for example when the application has been activated. The host receives the signals in an asynchronous fashion from the client. The display of the message might happen delayed. The Host is the system tray itself. It offers an interface for applications to register in a standardized way, acts on signals sent by these clients, and can do callbacks to the client application (for example to activate a window when the icon has been clicked). 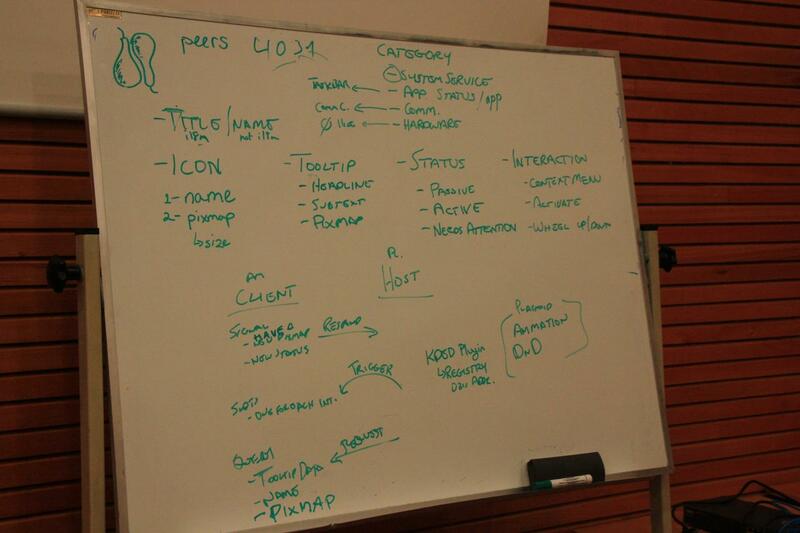 A first draft of the xml describing the spec is here (websvn link) based on Whiteboard at TokamakII. Documentation appropriate to xdg is being drafted [here]. It keeps the list of applications (dbus services actually) that want to use the systemtray, an application must explicitly register here to gain an icon. it's done outside the actual systemtray to mantain the icon list intact across different plasma sessions. Can be found somewhere in here. For now it's called DBusSystemTray, can be found here in websvn. It asks SystemTrayDaemon what the registered icons are and listens from it for new icons or removal of others. It will dialog with the applications using the protocol described in the above dbus specification. Some applications provides options for how the "needs attention" visualization should be rendered. This should not be a per-application setting, but something in the visualization itself, allowing for consistent (between items shown) and flexible (e.g. tasks widget vs system tray widget) presentation. This page was last modified on 28 July 2010, at 03:23. Content is available under Creative Commons License SA 4.0 unless otherwise noted.